Many gardeners these days have at least one rose bush somewhere among their landscaping. 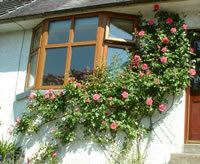 Some prefer the more compact bush style roses that are easy to manage and keep confined to small areas. Others however prefer the look of climbing rose bushes that grow big and tall and can literally cover an area with abundant blooms all season long. Those are the rose bushes we are going to discuss here in this article. While roses in general have the same basic requirements for growing, there are some key differences between growing bush roses and learning how to grow climbing roses that will definitely change how you grow them, so you need to understand these and make sure that you are prepared for them. The differences are somewhat small and can be easily accounted for, but if you don't, you are almost certainly going to be disappointed with the results your climbing roses give you. One of the biggest factors in learning how to grow climbing roses is making sure that you give them an ample amount of space where ever you plant them. Now this might seem like an obvious statement but it always amazes me how often I see gardeners misplace plants in their landscaping ideas. Let's face it, as gardeners we want what we want, and when we set our minds to adding a particular plant into our gardens, we sometimes will overlook the obvious drawbacks in order to make our ideas work. This isn't always the smartest move on our part, but we do it anyway. If you are planting a floribunda or hybrid tea rose, spacing isn't as much of a concern as most bush roses grow only about 4 to 6 feet tall, and usually slightly narrower than they are tall. Climbing roses don't adhere to this rule and healthy canes have been known to reach out as far as 20 to 30 feet on some varieties; however more often you can expect heights of about 12 to 15 feet. The important takeaway here is to take the time to look at the mature size of the climbing rose you have chosen, and make sure you give it enough room to reach that size. Just because it looks nice and compact now when you purchase it, doesn't mean it can't grow into a complete monster if left alone…and most varieties will if not maintained and pruned! 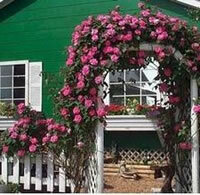 You will frequently here growers call climbing roses "vine" roses, because of the way they grow. From a technical standpoint roses are not true vines because they don't produce their own support structure to help them cling to other objects. Have you ever looked closely at true vines? You will see small thing shoots that grow out at different places along the vine that will wrap around anything they can get to. Vines use these "fingers" to support themselves. Roses don't have this ability so you will need to give them a little bit of help if you want them to grow up big and strong. 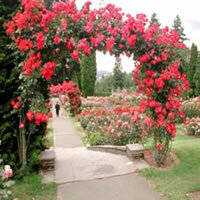 Common forms of rose supports are arbors and trellises. As your climbing rose grows, you can train the main branches to grow around the supports and by doing so, you are not only giving the plant the support it needs, but you can use the supports to shape the plant into a rough design and make it much easier to prune at the start of each growing season. Many growers fail to give their roses adequate support and then they wonder why their climbers grow every which way and become unruly. One of the most important factors when learning how to grow climbing roses is the condition of the soil you are going to grow them in. All roses require soil that drains very well in order to truly do well. If your soil is heavy with clay material, or is in a location that doesn't drain well and holds water for longer than usual, you should really find an alternate location to grow your roses in. A really good idea for most conditions is to add some perlite to the soil, especially if you have soil that is very heavy. This will help keep it loose and improve the drainage. Keep in mind the water still needs a place to drain too, so adding perlite to soil that typically remains soggy will not help it. You are going to want to start with about 30% perlite, along with 30% of a good compost. 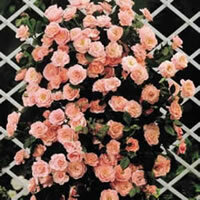 Mix that in with your existing soil and in most cases you will have an excellent base for growing climbing roses. The last thing we are going to mention in this article is another critical element in learning how to grow climbing roses, and that is proper sunlight. One thing gardeners frequently do wrong is they plant things where they think they will look the best, without regard to what the plant actually needs. This is a big No No and you will regret making this mistake with your climbing roses for sure. Roses are high bloom plants and as such they need a lot of sunlight to truly thrive. Anything less than 6 hours a day of direct sunlight and you are wasting your time. There are a couple of varieties that will do ok in partial shade, but none of them will produce great results without full sunlight. The more the better! So make sure when you are choosing the location, you have the right soil conditions, proper supports in place for your roses to grow on, and most of all, ample sunlight!